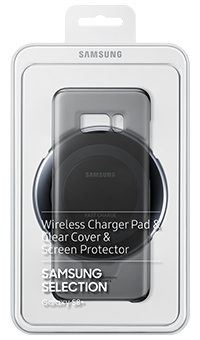 Make charging speedy and hassle-free with the Wireless Charger base, and protect your S8+ with the Clear Cover and Screen Protector. All in one great value bundle. 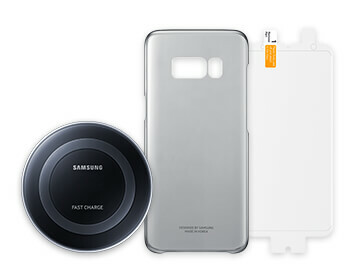 Ditch the wires and make charging your S8+ faster and easier with the Wireless Charger base. Just place your phone on the flat surface and let the lights tell you when you're powered up. This stylish charger also looks great in any home. With its semi-transparent design, the Clear Cover is the perfect way to show off your S8+'s looks while protecting its body from bumps and knocks. Just 0.8mm thick, it fits your phone like a glove and is comfortable to grip. Your S8+'s Infinity Display is a true show-stopper – don't risk it getting damaged by scratches and scuffs. The Samsung Screen Protector gives a thin, flexible layer of extra protection that keeps your screen pristine and your mind serene.